When you hear "bruschetta" you think tomatoes. 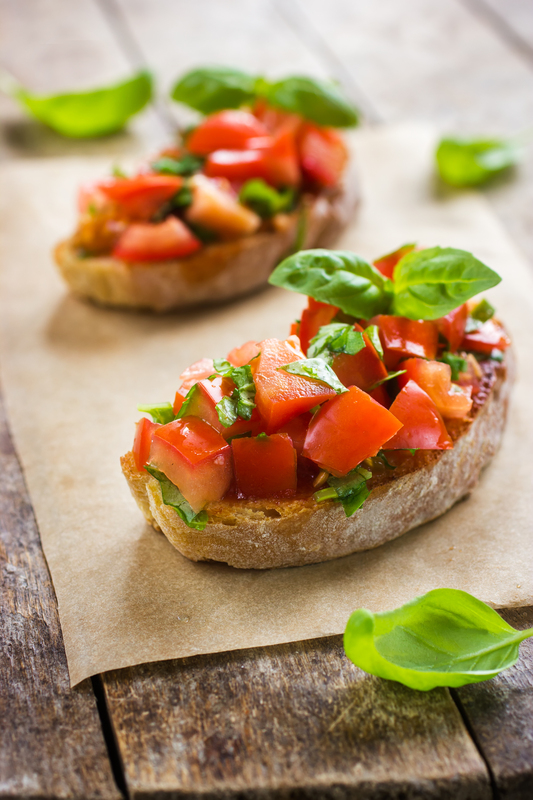 Technically the term bruschetta, meaning "to roast over coals", refers to slices of bread that are rubbed with garlic, drizzled with olive oil, salted, peppered, and baked. Essentially it's a crostini... a crostini that we're going to top with marinated tomatoes and freshly cut basil. Start out by making a vinaigrette by combining the olive oil, vinegar, oregano, salt, and pepper. A vinaigrette, like this one, containing three times more oil than other liquids will emulsify when whisked vigorously. If you prefer, you can simply combine the ingredients without whisking. This is called a "broken" vinaigrette. Combine the diced tomatoes, basil, and vinaigrette mixing gently so as not to smash the tomatoes. Let marinade for 24 hours - up to 5 days. If you like a stronger tomato flavor, let your bruschetta sit long than 24 hours. The vinegar will begin to break down the tomatoes, releasing tomato juice into the olive oil. To serve, brush some toast points with olive oil and freshly cracked pepper. I'm using a garlic infused olive oil because I like the combination of garlic and tomato, but regular oil is perfectly acceptable. Bake the toast points at 500 degrees until golden brown. While they're still warm, top the toast points with the bruschetta mixture..